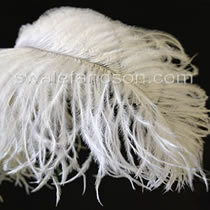 Our #1 Quality Ostrich Wing Plumes are our most popular selection. These feathers will all be perfect or near perfect. All plumes are hand selected for quality then steamed to eliminate all twists and wrinkles. #2 Quality Plumes can still be nice, but these feathers will all be flawed to some degree. We do not steam these feathers, so they will need some help to look their best. These plumes can still be used for centerpieces and costuming. Ostrich Wing Tertiaries (aka Byocks) could pass for either large full Drabs or smaller sized Wing Plumes. Byocks are technically Wing Feathers but not quite the same as what we call "Plumes". Still they are nice feathers that make beautiful centerpieces. 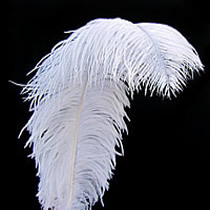 Minimum order quantity for # 1 Wing Plumes is 20 feathers per color. Minimum order quantity for # 2 Wing Plumes is 20 feathers per color. 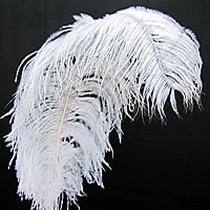 Wholesale Ostrich Wing Feathers are the best feathers to use for tower vase centerpieces. Ostrich Feathers are very large and very beautiful. Their quills are about as thick as a pencil and the fibers get up to about 8-10" in length. Ostrich Wing Feathers have very thick fibers and the longer ones have droopy tips that hang down when mounted in a tower vase. Most people use between 15 and 25 ostrich feathers per centerpiece depending on budget and personal taste. Long Ostrich Drabs are commonly used as a substitute for Wing Plumes and are also very beautiful, but if you desire the most plush and luxurious look to your centerpieces, Ostrich Wing Plumes are the best choice.